NEW YORK, New York, October 28, 2011 (ENS) – New agreements to manage 10,000 acres of federal and New York City parklands around Jamaica Bay as a single unified park and improve overall water quality in the bay were signed Thursday by city and federal officials. Mayor Michael Bloomberg and Secretary of the Interior Ken Salazar signed an agreement for a joint planning process that will devise a new, unified governing model and new, common objectives for 10,000 acres of public land in south Brooklyn and Queens. The Rockefeller Foundation and National Grid will provide financial support to design a conceptual master plan for the Jamaica Bay Parks that includes research projects on resilience to climate change in coastal environments and improving park access for the surrounding communities. “The agreements with our federal, state and philanthropic partners will have with far-reaching benefits for what may be the greatest natural treasure lying within the borders of any city in the nation – Jamaica Bay,” said Mayor Bloomberg. “The partnership with Secretary Ken Salazar and the Department of Interior will allow us to be bolder, more innovative, and more cooperative, by managing these extraordinary public lands around the bay as one great urban park,” said the mayor. “It’s all in keeping with PlaNYC and our ongoing transformation of New York City’s waterfront as a place for New Yorkers can live, work, and play,” Bloomberg said. The National Park Service and New York City Parks will cooperate to manage contiguous lands with overlapping missions. Through land use and program planning that ignores boundaries, officials say they can create a seamless, interconnected network of natural, historical, and recreation spaces that all New Yorkers can visit, with or without a car. 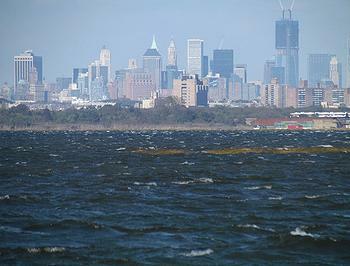 “As coastal cities throughout the world continue to grow and are increasingly susceptible to the impacts of climate change, the restoration of Jamaica Bay provides an incredible opportunity to build our understanding of resilience in urban coastal areas,” said Judith Rodin, president of the Rockefeller Foundation. “Jamaica Bay is a beautiful, but often overlooked pocket of our city’s landscape, and The Rockefeller Foundation is thrilled to help give back to the community parkland that will serve as both a recreational and educational space,” she said. 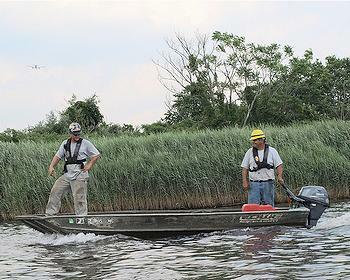 As part of this effort, at the request of the city and the New York Department of Environmental Conservation, the U.S. Environmental Protection Agency will designate the majority of Jamaica Bay a “No Discharge Zone,” which bans boats from discharging sewage into the bay, improving water quality. The Jamaica Bay No Discharge Zone encompasses 17,177 acres of open water and 2,695 acres of upland islands and salt marshes in Brooklyn and Queens. The area has adequate facilities for boats to pump out their sewage and boaters must now dispose of their sewage at these pump-out stations. Discharges of sewage from boats can contain harmful levels of pathogens and chemicals such as formaldehyde, phenols and chlorine, which harm water quality, pose a health risk and impair marine life. The city and the National Park Service will improve public access to Jamaica Bay and within Jamaica Bay through existing and new transportation choices, and through better public information about those options, federal and city officials said. Through better coordination of research, data gathering restoration efforts and pilot projects, government agencies, non-profit organizations and academic institutions can work closer together to restore and conserve the health of Jamaica Bay. The agreement provides that the City of New York and the National Park Service will jointly develop a series of programs in which urban youth can learn the values of stewardship through service activities. The agreement may be expanded in the future to include federal and city park lands on Staten Island, one of New York City’s five boroughs.